Introducing Michigan-Only Release: Palm Reader - Founders Brewing Co.
Posted on April 12, 2016 by Founders Brewing Co.
Hi there! Dave Engbers here to share some exciting news with my fellow Michiganders: I’m very happy to introduce Palm Reader, a pale ale made with Michigan-grown hops. 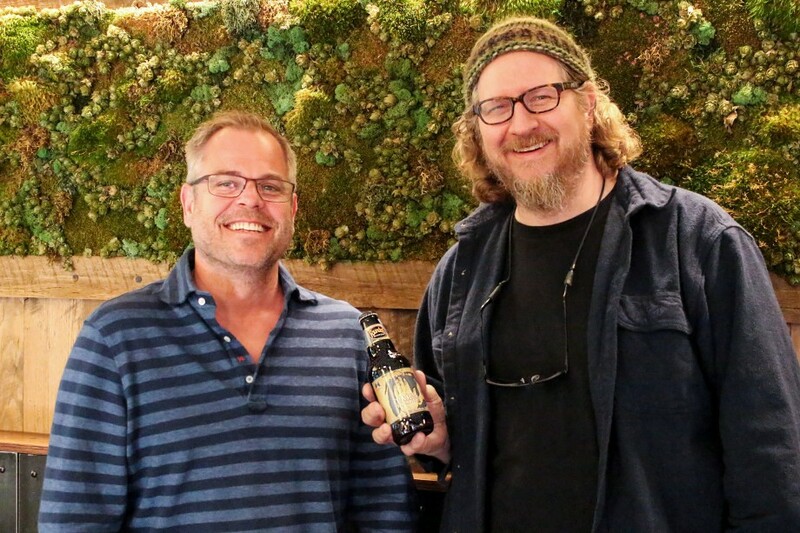 Proceeds from the sale of this beer are going to support Grand Rapids Whitewater, a organization focused on restoring and putting the rapids back in the Grand River. It’s a cause that I’ve been passionate about for years and I’m glad we can support it doing what we do best: brewing kickass beer. You’ll find the beer on Michigan shelves beginning in early May. We talk a lot about legacy here and Mike and I have become progressively more focused on supporting things that we really care about; things that we believe will make our community a better place years from now. We’ve been supporters of Grand Rapids Whitewater and their vision of restoring the natural beauty and recreational opportunities to the Grand River since 2010. It started with a conversation over beer, as most things do around here, and as the Grand Rapids Whitewater team shared their vision, we became fully invested in their cause. Having the opportunity to take that partnership to another level with the Palm Reader release is something we are proud of considering how important this cause is to both of us and to the continued legacy of the company we built. So, a bit about that beer… a tribute to our beautiful state, Palm Reader is made with Michigan-grown Crystal and Zuper-Saazer hops. Derived from Saaz, a traditional noble hop hailing from the Czech Republic, these Zuper-Saazer hops, grown locally at Hop Head Farms, impart intense and fruity aromas. Combined with the citrus notes of the Crystal hops and the simple malt bill, this beer is crisp, bright and delicious. Palm Reader comes in at 5.4% ABV and will be available in 6-pack 12oz bottles with a suggested retail price of $9.99. The proceeds from the beer will support “Tribute on the Grand,” a fundraising event in support of Grand Rapids Whitewater. It’s a free event we’re hosting, along with FOX17, on September 10, 2016 at Ah-Nab-Awen Park in downtown Grand Rapids. We’ll be featuring local bands along with national tribute bands and, of course, plenty of Founders beer. Palm Reader will be on tap for this special event as well. There will also be a one-of-a-kind beer dinner that will take place on the Gillette Bridge, overlooking the Grand River, with tickets going on sale in June. We’d love to see you there. Stay tuned for more information on Palm Reader, Tribute on the Grand, the band lineup and more via our website, Facebook, Twitter and Instagram.